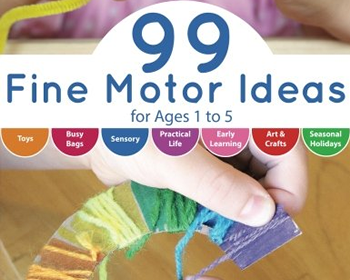 99 Fine Motor Ideas for Ages 1 – 5 with playful ideas to help you create fun activities to encourage fine motor skills. DIY Toys, Busy Bags, Practical Life Skills, Sensory Activities, Art & Crafts, Early Learning and Holiday themed activities! Each activity includes full color photos, a materials list and step-by-step instructions. It’s a fantastic resource for parents, educators and caretakers. 99 Fine Motor Activities presents fun, engaging ideas to involve the fine motor muscles in your child’s hands, fingers, and wrists. Ten talented moms come together to share the most successful, creative, and inspiring invitations to play that they set up for their own kids to get those little hands working! Spread the word about it and earn 9.09% of the purchase price on sales you refer.